The presentation was made during a ceremony at the Hilton Birmingham Metropole Hotel, at the NEC recently. 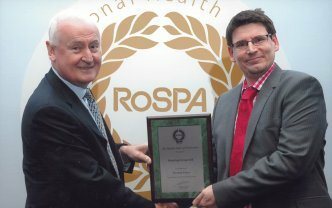 David Rawlins, RoSPA's awards manager, said: "The RoSPA Awards encourage the raising of occupational health and safety standards across the board. Organisations that gain recognition for their health and safety management systems such as Boulting Group contribute to a collective raising of the bar for other organisations to aspire to, and we offer them our congratulations." Terry Marston, executive director of Boulting, said: "Our continuous and proactive management and our top-to-bottom behavioural approach to all aspects of health and safety, combine to underpin our committed strategy of Target Zero for all accidents and safety related incidents."